This weekend, my good friend Shaun came for a visit. Being that he's one of the few vegans I know in real life, it's always fun to cook meals and/or go out to dinner with him. Being that he's from Albuquerque, the vegan choices in town are vastly different than what he has available. Breakfast one morning at the ever fun and funky Squid & Ink. Personally, I'd go just for their gravy. Cover anything in gravy and I'll eat it. We also went shopping for vegan groceries (and for curiosity's sake) at SideCar for Pigs Peace. Not that we specifically needed any groceries. But they're an all-vegan grocery store that supports a Pig Sanctuary and we found all kinds of fun stuff that you may see in featured in future blogs. Cheezely Cheese, Bacon Salt (which totally tastes like bacon but is vegetarian! ), and on and on... if you're ever in Seattle, check them out. After groceries, we hit Mighty-O Vegan Donuts. Another MUST TRY if you're on Shaun's tour of the town. Applaud our self control. We resisted buying out the entire store. In fact we limited ourselves to six. Shaun's like a kid in a candy store when we go to Mighty-O. See how delighted he is with his choices? Last but not least, supper at Teapot Vegetarian House. 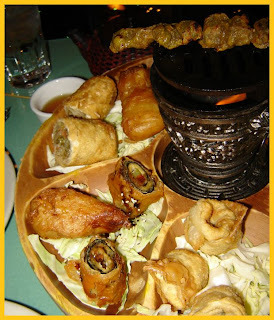 Check out the "Bobo Platter Sampler" (and this is just the half we hadn't eaten!!!) the thing is huge; filled with spring rolls, fried seaweed wraps, satay (toasting over the little fire - woo - cool!!) , tofu fritters and realistic rose "chicken" drumettes complete with a bit of sugar-cane as the "bone". Insane. Delicious. The boy would totally fly here from Ab'q. just for those mock-chicken drumettes. Yes. They are that good. After dinner, our dessert was almost too pretty to eat. 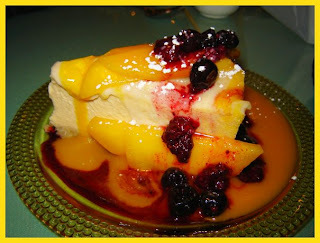 Beautifully presented Mango "cheese"cake with mango-berry sauce. I seriously considered licking the plate clean. This concludes our Vegan Tour of Seattle for today. Yes, I could go to these places on my own, but it's always nice to share them with friends. If you're ever in town, let me know! And stay tuned. A little excitement coming up in a few days. 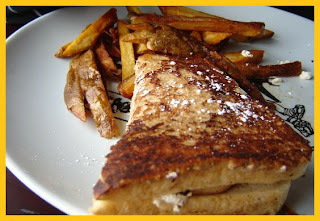 Oh wow, I used to love monte cristo's as a child... how does one make them vegan?! Sounds like a great tour, you are a lucky lady to live nearby such great places! My friend brought me 2 dozen donuts from Mighty-O when he flew back to LA from Seattle where he was home over the holidays. Let's just say I was one happy camper. Ohhh, vegan poutine!? That looks absolutely delicious and is now what I'm craving but have no idea how to make. I used to live near the Canadian border, and loved getting poutine when my family went over to the mall in Ontario -- hadn't even thought about it in years though! I think I'll have to scour the internet for some recipes now. Man, I'm so jealous of ya'll northwesterners! A trip to Mighty O's would be a dream come true!!! 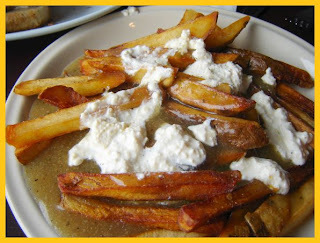 And I keep meaning to try to make my own version of poutine. I've heard about and it sounds fantastic. I'm like you on the gravy thing...every thing is better smothered in gravy. this post makes me want to make the drive over the mountains right now! i LOVE mighty-o donuts :] and i'm very intrigued by the poutine. Do you have a spare room? I want to live in Seattle now! i want one of those doughnuts. you definetly take living in a vegan friendly place for granted!!! I would die if I even saw that delicious food being served around here, hahaha. I'm glad you and your friend had a great time. holy crow Shaun has green eyes!!! -Hickory- Bacon Salt is vegan and I see they've added all sorts of new flavors and products since I last looked. I also recommend Bamboo Garden. Tho' they bill themselves vegetarian, most of the offerings are vegan. Taking carnivores here for dinner never got old. 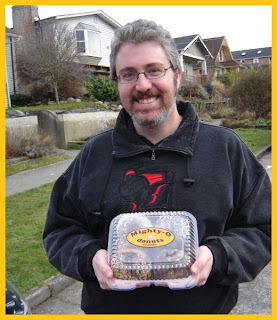 A while back I was talking to Anthony (seattle vegan meetup organizer) and I was talking about Seattle area bloggers and he knows you. small world. 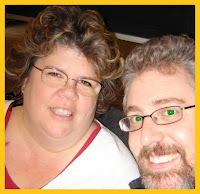 It's always fun to see restaruants I know reviewed on blogs. I always end up burning the satay sticks on the bobo platter. oops.